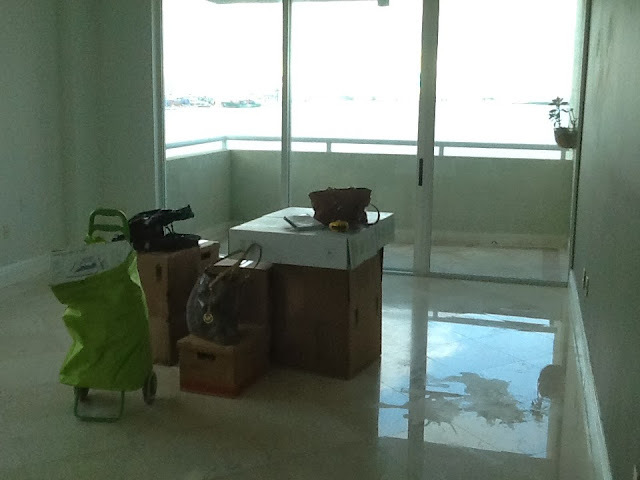 This light-filled apartment with a killer view of Miami, belongs to my second bachelor client of the year, Mr. B. Well, he does have an amazing girlfriend, so technically, he's not a true bachelor. Anyway, I digress. Mr. B owns a home in Spain but works, lives in Miami and travels the globe for work. Renting, not owning a place here was his best option. 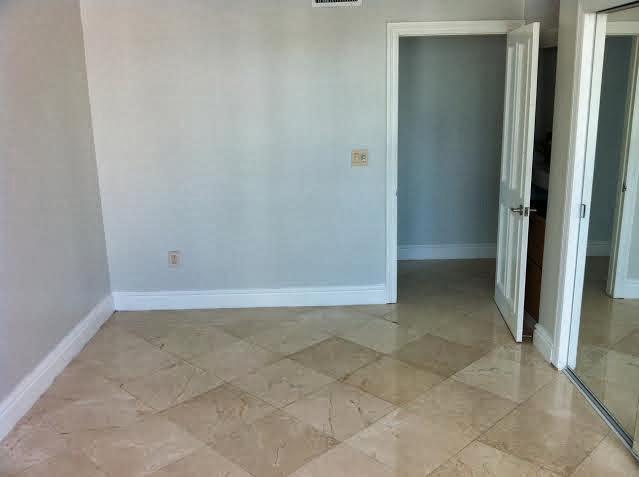 This little cave of an apartment on Miami's Brickell Key is a prime location, but oh, the apartment was so gloomy it felt mildly depressing. Yes, yes, when will I learn to remove handbags from my before photos? Anyway, handbags aside, pretty gloomy looking no? Mr. B wanted the grey wall gone and some more fun colors introduced. Once we'd settled on the large items like this very comfy sectional from Z Gallerie, he left me to my own devices to purchase other items. I scored this rug from Home Goods and thought it's rust tones added color and warmth to the space. As always, I try to mix high tickets items with more budget friendly options so scored these end tables from Overstock. He swooned for this swing arm lamp from Crate and Barrel. Can you blame him? He is an avid reader, so his book collection served as great accessories on this Overstock coffee table and throughout the condo. This little nook needed some special love and attention. This Ikea table is a favorite of mine because it's so versatile. It fit perfectly here. The Target lamps add extra lighting and the Nate Berkus baskets serve as both extra storage and seating for additional guests, and I love their amazing texture. 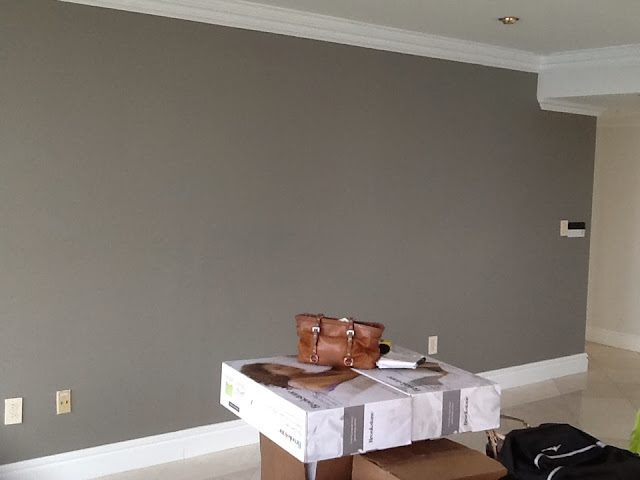 Y'all know I loves me some grey paint, but it admittedly made this apartment feel exceedingly gloomy and he hated it so much that it had to go. Since this is a rental, we only painted accent walls, and not the entire apartment. Here we added a warm beige with a brown banding, which added some visual detail on the wall in lieu on spending loads of money on art to add to this very long wall. 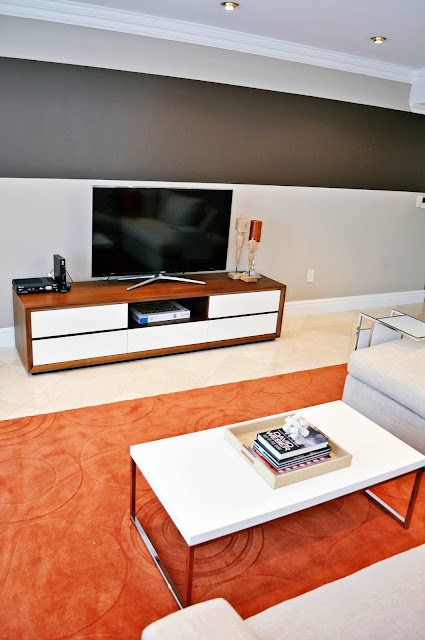 The accent wall is also the perfect backdrop for this walnut and white media console which we all fell in love with, but lost out to another buyer who'd purchased the last two! I cannot tell you the anguish I had over that, but luckily the buyer decided she only needed one and now voila, this splendid piece now sits very pretty in this space. Around the corner from the living room is the first of two bedrooms, a tad smaller than the second bedroom but since it had an en suite bathroom he preferred to have it serve as the master. He already had this amazing duvet from Pottery Barn and it was the perfect finish for the bed. A very longggggggggg hallway connects the rooms to the living room, so to add some interest without breaking the bank, we framed inexpensive prints of some of his favorite cities and used the water view he sees from the apartment as inspiration for the striped detail on the wall. 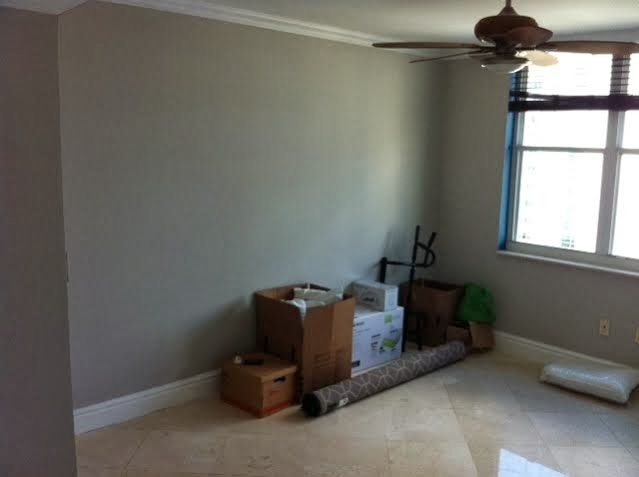 We carried that blue into the second bedroom which he does double duty as his office and guest room. An inexpensive day bed from Ikea takes up minimal real estate in the room while providing seating and a comfy place for guests to sleep. He fell in love with this desk from West Elm and we paired it with this a stylish yet comfortable chair from Modani. A gallery wall of maps of his hometown and other cities that he loves offers a sense of connection to Spain and Europe, even as he now calls Miami home. A huge thanks to Mr. B whose emails kept me royally entertained. We often got lost in translation, as English is his second language. We had a blast sending photos, emails and text messages back and forth, since he was not here for much of the project, and we needed to make sure he understood all that was happening. A bigger thank you to his amazing girlfriend Paula, who trusted me enough to recommend to Mr. B that I take over the reigns of this design project, so he could live in style. Curtain panels - Ikea but customized by Titan Decor. You're on your A game lady! I love it! The Homegoods rug works beautifully with the Zgallerie sectional. Love the banding effect of that accent wall too; genius! bachelors love you!!! Such a great transformation!! My boyfriend way back when used to live in Brickell key! beautiful work friend! I love it. wow! this turned out so so amazing! love the paint in the hallway and i'm so jealous of that desk. you did another fabulous job! I'M OBSESSED! I hope I win the mega millions so that you can do my house!! You know, I bet you are responsible for getting some of the Bachelor's married. It might be a bit of false advertising if they let their 'lady friends' think that they have all this good taste, but I bet they never let on that it was you. Great job!! Sister you're on fire, fab job! Such a treat to follow you!! Okay, what's up with all the Bachelors? You've captured the Miami market? It looks great and feel fresh! Nicely done! I love what you've done. It has such life now. Shut up girl….you spanked this place! The mix of high and low is fabulous….you always do such a great job pulling it all together!